The convergence of many factors such as low cost sensors, electronics, computing, machines, and more recently machine learning have created the potential for changing the way users engage with the physical world. This talk will explore and demonstrate how we can create new interfaces and interactions that leverage our knowledge of the physical world. In the first part of the talk we will explore how any consumer with little knowledge of computers can repurpose everyday objects and or shapes and quickly customize them. We explore AR as a means to interface with the physical world while creating and making these designs. As a result of low thresholds and simple user interactions with lower cognitive loads, users are shown to explore multiple creative pathways in collaborative ideation. In the second part we introduce a physical browsing means to interact with a smart IoT environment. Then we (a) explore how users can interactively construct and control robots with the help of mobile AR interfaces, and (b) transform everyday objects to interactive objects using a soft interface. In the last part of the talk we will examine how deep learning can be used in geometric interfaces and interactions. 'SurfNET', transforms a single image into 3D shapes, retrieves shapes, and even hallucinate shapes that it has not seen. Using deep learning 'DeepHand' captures users hands and interprets its motions. We envision a future where users naturally interact with the physical world using smart devices and interactions. 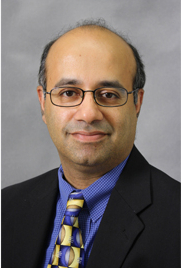 Karthik Ramani is the Donald W. Feddersen Professor of School of Mechanical Engineering at Purdue University, with courtesy appointments in Electrical and Computer Engineering and College of Education. He earned his B.Tech from the Indian Institute of Technology, Madras, in 1985, an MS from Ohio State University, in 1987, and a Ph.D. from Stanford University in 1991, all in Mechanical Engineering. He has received many awards from the National Science Foundation (NSF) and other organizations. He has served in the editorial board of Elsevier Journal of Computer-Aided Design (CAD) and the ASME Journal of Mechanical Design (JMD). In 2008 he was a visiting Professor at Stanford University (computer sciences), research fellow at PARC (formerly Xerox PARC), and in Oxford University Institute of Mathematical Sciences in summer 2016. He also serves on the Engineering Advisory sub-committee for the NSF IIP (Industrial Innovation and Partnerships). In 2006 and 2007, he won the Most Cited Journal Paper award from CAD and the Research Excellence award in the College of Engineering at Purdue University. In 2009, he won the Outstanding Commercialization award from Purdue University. He was the co-founder of the world's first commercial shape-based search engine (VizSeek) and more recently co-founded ZeroUI whose product (Ziro) won the Best of Consumer Electronics Show Finalist (CES 2016). He has won several best paper awards and in 2014 the Outstanding Research Excellence Award from ASME Computers and Information Sciences in Engineering Division. NSF recently invited him as a distinguished speaker in cyber-learning and engineering maker spaces. In 2015 he won the most cited researcher for 2005-16 in the Elsevier CAD journal. His recent papers have been published in venues such as ACM (SIGCHI, UIST); IEEE (CVPR, ECCV, ICCV, TVCG, VAST), TEI, CAD and ASME JMD.